Delta offers much for the visitor to see and do. Of course, there is the never-ending view of the magnificent Alaska Range. Free ranging and fenced herds of buffalo, fenced herds of reindeer, elk, cattle and even Tibetan Yaks share the bounty of the land with moose, caribou and homesteaders in the area. Great fishing can be enjoyed in the numerous lakes and rivers. Fly-in fishing and hunting trips are available locally. You might try a flight-seeing trip around the area in a “bush” plane or take an evening wildlife tour in a bus, a canoe or a riverboat. Pipeline bridgeA wonderful view of the Alaska Pipeline as you cross the Tanana River bridge eight miles north of town, will be sure to bring the cameras out. You can also tour an operating pipeline pump station just 6 miles south of town. Photo courtesy of Steve and Kathy Fields . The Delta Junction area is the home of two state campgrounds, Clearwater Recreational Site and Delta Recreational Site and two state parks, Quartz Lake State Park and Big Delta State Historical Park. Sullivan Roadhouse historical sign. We also have a wonderful visitor’s center and Sullivan Roadhouse, the oldest roadhouse in Interior Alaska. Built in 1905, it is now the only restored roadhouse and historical museum in the Interior of Alaska. Or you can tour an operating homestead and experience what life was like in the early days of Delta. Tours of farms including dairy, beef, and hog operations are available. Delta is home to a meat processing plant and one of only 2 dairy processing facilities in Alaska. Check out the spectacular gardens, both commercial and private. With the long daylight hours, Alaskan’s grow some huge produce! Delta Junction is an ideal place to view the spectacular Aurora Borealis or “Northern Lights” as they are commonly known. The aurora is most often seen from September to March. From May to mid-August the summer skies are too bright. It is possible to see northern lights more than 200 days a year. The best viewing time is 10:00 PM to 2:00 AM, but it is possible to see them anytime it is dark. Delta’s location and small concentration of street lights allows for excellent viewing. The Alaska Highway was built during World War II as a military road to bring supplies to the Interior of Alaska and to airfields enroute that were being used by aircraft flying to Russia as part of the “Lend-Lease Program”. The entire 1422 mile Alaska Highway was built in a quick 8 months in 1942. 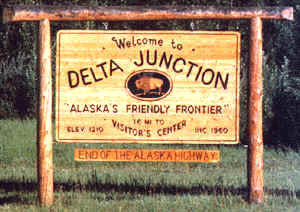 Construction began at what is now Delta Junction and headed southeast. Other construction sites included Dawson Creek coming north and Whitehorse going both north and south. In Delta the Alaska Highway connects with the famous “Valdez-Fairbanks Trail (also known as the Richardson Highway). 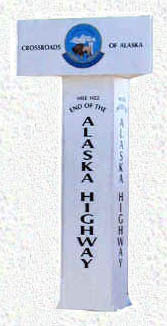 Alaska, British Columbia and Yukon Territory honored the builders of the highway and it’s 50th Anniversary with a yearlong celebration in 1992. Delta is in the process of developing a transportation museum featuring this amazing feat of construction. You can view several large pieces of historic road maintenance equipment on the grounds of the Sullivan Roadhouse museum. The Visitor’s Information Center also has several books available telling the highway construction story.